When we were in Vietnam we fell in love with pho, the “noodle soup that build a nation”; eaten for breakfast, lunch and dinner and sold in hundreds of make-shift street stalls on virtually every corner in Hanoi, the nation’s bustling capital. We would perch on tiny plastic stools with soup and chopsticks in hand, slurping down the powerful broth while millions of motorbikes provided a symphony of background humming. The most common – and best – was pho bo, rich dark beef stock laden with strips of tender meat and tendons of beef, fragrant spices and light noodles. There was always a basket of bright leaves served alongside, herb-like greens which, when torn in rustic pieces into the bowl gave the perfect balance of freshness to the meaty soup. This is my own, slightly simpler version of noodle broth. Although it doesn’t compare to proper Vietnamese pho it’s a reasonable substitute! To make this recipe you will need to invest some time in making proper beef stock. This takes at least eight hours of gentle simmering and I urge you to do this; the resulting flavour will be far superior than any shop-bought alternative. I haven’t added any actual meat to the soup as I reckoned there is enough flavour from the stock alone, but feel free to add some strips of cooked beef if you wish. Firstly make the beef stock: Heat the oven to 200C and roast the bones until dark golden brown. Meanwhile, roughly chop 1 carrot and the onion and, along with the garlic, lightly brown in vegetable oil in a large pan. Add the wine and boil for 3 minutes to remove the alcohol. Add the beef bones, the thyme and bay leaf. Fill with cold water until just covered, then slowly bring to the boil, skimming any scum that rises. Simmer very gently for 8 hours, topping up with more cold water when necessary. Strain off the liquid into a clean pan, and boil until reduced to about 1 litre. For the last 10 minutes add the ginger and chilli. Season carefully with salt, and set aside. Bring a pan of salted water to the boil. Peel the carrot into ribbons and finely slice. Peel the celery and finely slice. Add all the vegetables except the spring onion to the boiling water and cook for 2 minutes. Lift out with a slotted spoon and rinse under cold water. Cook the noodles in the boiling vegetable water for 4 minutes, then drain. 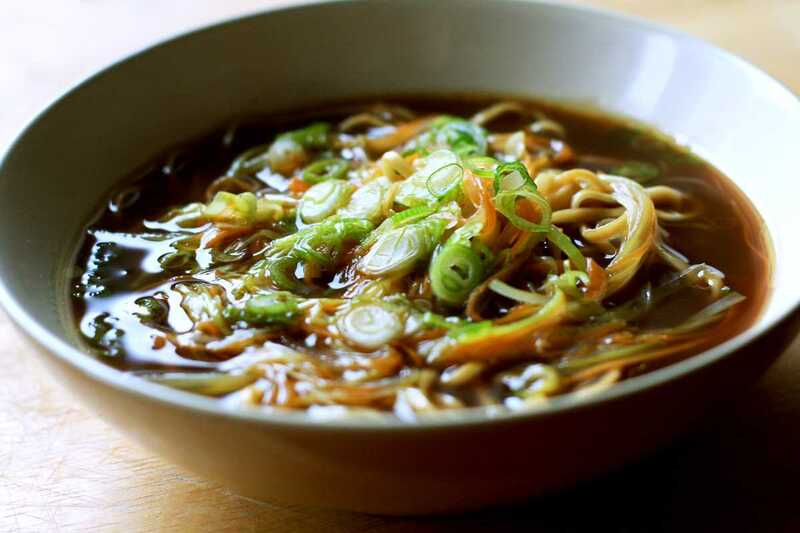 Divide the noodles and vegetables between 4 bowls, then ladle the hot beef stock over the top. Sprinkle the spring onions over the top, and serve.